Observation - the white stuff - UK and Ireland. 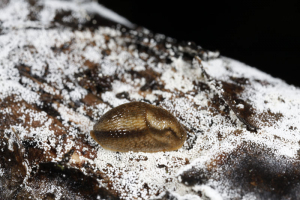 Description: Scale slug about 1cm or slightly bigger so the white blobs are rather small but covering wet rotted wood. Scale slug about 1cm or slightly bigger so the white blobs are rather small but covering wet rotted wood.